Our February 2013 case of the month will do nothing short of amaze you. This 37 year old professional male's chief complaint was his uneven even smile. He had seen and heard that Dr. Emery is one of the top cosmetic dentists in Chicago, and that she is a certified Invisalign provider. Upon consultation we confirmed his candidacy for Invisalign, and began working on his treatment plan. One of the most important items to address before beginning Invisalign treatment is any outstanding dental work. 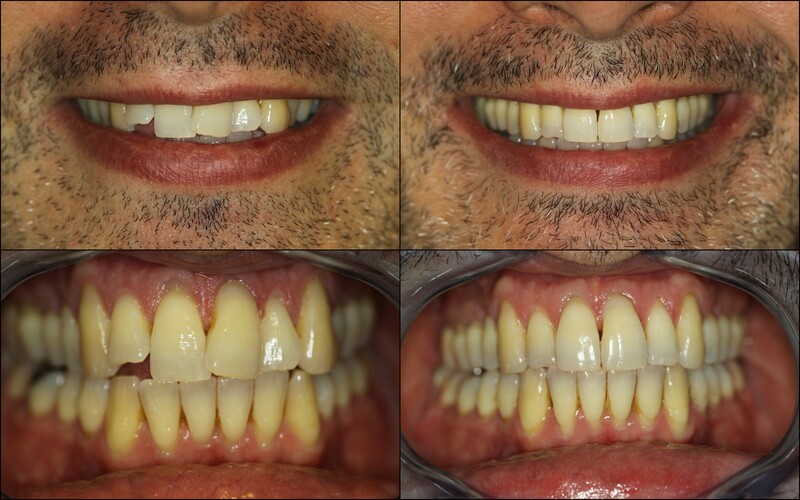 Because the trays are custom fit and treatment can sometimes last up to a year, it's essential we treat any problems prior to taking your impressions. Once all teeth are restored and healthy, we can begin taking the required records for Invisalign. This includes a series of photos that show your teeth from several different angles. We even take aerial shots. We will also submit a full series of digital x-rays, to help the folks at Invisalign detect the root of the problem (no pun intended). Finally, we take upper and lower impressions of your teeth, which will be used to fabricate your aligners. From there, Dr. Emery will communicate directly with Invisalign to work up your case. When she is happy with the outcome she will approve the case, and Invisalign will begin production. It generally takes about 4 weeks from the time your case is approved to the time it arrives at our practice. Upon your initial visit, we will deliver the first aligner of your series. Each aligner is worn for 2 weeks, and we deliver 3 aligners at a time. Thus meaning we see you every 6 weeks for a visit, and to deliver 3 more aligners. In some cases, Invisalign will prompt Dr. Emery to make adjustments and use techniques to speed up or improve your final case outcome. Should that occur, you will be informed of any necessary minor adjustments or manipulations prior to case acceptance. Compliance is key for the success of Invisalign. We regularly tell patients treatment is somewhat self-managed, and it's important to wear the aligners 20-22hrs a day. Patients are commonly concerned about eating and drinking, and how the aligners will affect their speech. The short answer is; it will most likely take a couple days to get used to. From there out, most patients report the aligners feel like a "second skin," and they hardly notice them. Another perk! Like its name, Invisalign is truly invisible to those around you, which is why it's so popular among adult professionals. All cases vary in duration, but a majority of cases are completed in about 12 months. Once complete, we will order your final retainers for nighttime wear, and celebrate by hooking you up with complimentary professional whitening products! A beautiful smile is often measured by how straight and white a person’s teeth are. That said, Sugar Fix Dental Loft has got you covered. Contact Chicago cosmetic dentist, Dr. Jessica Emery, and the team at Sugar Fix Dental Loft to schedule a consultation for Invisalign, or any other cosmetic and restorative dental treatment needs.